Colgate-Palmolive Co.'s Stock Split History: Is There Another One in the Works? The consumer-products giant has a long history of splitting shares and providing double-digit returns, and with its share price at all-time highs, could another Colgate stock split be in the works? Colgate-Palmolive has a history of splitting its stock, but even though its stock price is at an all-time high, the consumer products giant may not yet be ready to split it again. Image source: Getty Images. 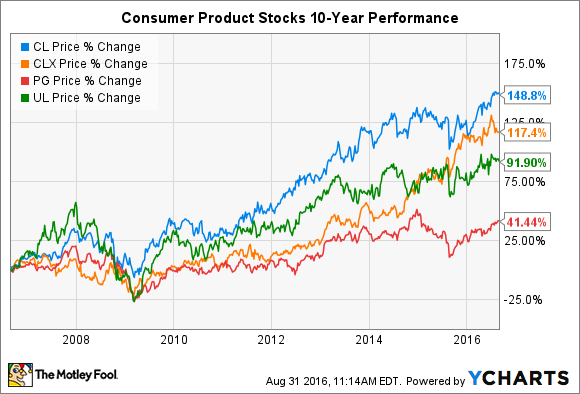 Few companies have performed as well as Colgate-Palmolive (NYSE:CL) has over its nine-decade history, rewarding shareholders along the way with both stock splits and durable dividend payments. At its current $75-per-share price, Colgate stock sits at an all-time high and could mean it's due for a stock split. Yet even with double-digit total return percentages over the past decade, Colgate investors sometimes had to wait long whiles before the personal care products company split its shares. After splitting its stock several times during the 1990s, shareholders suffered a 14-year drought before Colgate split them again in 2013. Now with its stock soaring once more -- up more than 20% over the past year -- investors will want to know how long they'll need to wait before the next split occurs. Data source: Colgate-Palmolive investor relations. There have been times when Colgate hasn't been shy about splitting its stock, and then at other times there have been long dry spells. The last time it split its shares, it didn't provide a rationale behind it, though the stock was trading north of $115 at the time. That was also a period, though, when competitors' stocks were relatively cheap by comparison: Clorox (NYSE:CLX), Procter & Gamble (NYSE:PG), and Unilever (NYSE:UL) were all trading some 30% to 70% lower than Colgate-Palmolive. But that's not the case today, however, as Clorox trades at $130 a share and P&G goes for $87. Only Unilever at $46 a stub is lower. Of course, the effect of a stock split doesn't really change your ownership stake in a company. While a 2-for-1 split will double your shares, the value of each share will now be half what it was. But it's often considered a bullish indicator by the market that management believes in the strength of their company's business that it will be even better in the future. By lowering the price of a stock, it may also bring in additional smaller investors who might otherwise not be able to buy more than just a few of the pricier stubs. Even so, there is the possibility it will also increase a stock's volatility as smaller investors jump in and out of a position. Colgate-Palmolive is the world leader in certain consumer product categories. For example, it owns 43.8% of the global toothpaste market and 33.5% of the manual toothbrush market. In individual markets and with various brands Colgate's market share runs north of 50% or more. In France, it owns half the fabric conditioner market; in Brazil, it controls nearly three-quarters of all toothpaste share; and in Mexico, its market share runs over 80%. With global brand recognition and a drive to improve its leadership positions in key product categories, Colgate-Palmolive is positioned to continue leading in its core capacity. That should help improve revenue and profit growth rates, though it may not lead to a stock split just yet. It is able, however, to continue rewarding investors with a nearly unequaled record of dividend payments. It has consistently paid dividends without fail since 1895 and has increased the payout to shareholders annually for 53 years. If Colgate's stock breaches triple digits again, then investors might want to start thinking about a split. In the meantime, though, they should probably be content collecting their quarterly dividends since, if it stays on its current trajectory, it's not likely going to be another 14 years before Colgate-Palmolive splits its stock again.